Following our campaign to request that the Lowell Group reconsider their claim against James Coll, the company is still insisting that Mr Coll pay the debt and has passed his file on to its legal arm, Hampton’s Legal. The Lowell Group are persisting in their threats against a member of our community who has always claimed he had no knowledge of the original contract. We think Mr Coll should be allowed to focus on his energies on the cancer treatment he has been undergoing for the past three years instead. We request that you take part in a phone blockade against the company in an effort to show the strength of our feelings. Please call the Lowell Group on Monday 10th September between 10am and 2pm. You can contact them on 0113 308 6000, 0113 308 6035 or 0113 308 6345 and ask them to stop pursuing James Coll’s debt. The relevant account number is 94884193. We ask that callers are polite at all times. Remember, entering 141 before the number will conceal your number if you wish to remain anonymous. The Lowell Group are no strangers to controversy having been the subject of a Watchdog investigation into their pursuit of fictional debts in the past. The Struggle Against Financial Exploitation website also has some interesting information about some of the unscrupulous methods employed by the company. A few months ago Nottingham Solidarity Network were contacted by James Coll. He informed us that he had been receiving demand letters from the Lowell Group, a debt recovery company based in Leeds. They had bought a debt from Shop Direct and were now intent on collecting the money from Mr Coll. The account had not been opened up or used by Mr Coll, he had not signed for anything, and was both unwilling and unable to pay the debt. The Lowell Group are now threatening litigation in order to collect the debt. Mr Coll’s account number is 94884193. This is a debt purchased from Marshall Ward and their company Shop Direct. Mr Coll is being threatened with litigation due to an outstanding balance of £1541.27. He has been in touch with Lowell via Aid Uk, who informed them that the original Shop Direct account was not opened up by Mr Coll, but a third party. Lowell know of this third party, and they have been in contact with them, but as they were unable to work out a payment plan they have continued to direct their focus on Mr Coll. The account was not opened with his blessing nor knowledge. He did not sign for the account nor knew about it until the letters that Lowell have sent to him. Furthermore, Mr Coll does not have the means nor the inclination to pay for a debt built by a third party, and believes that Lowell are unfairly targeting him at a time in his life where he needs to be focusing all his energies on his recovery. We believe that Lowell would be gravely mistaken in pursuing further action against a man who is seriously ill and who had nothing to do with the account to begin with. We are members of Mr.Coll’s community, and will be supporting him throughout this process. A few weeks ago Nottingham Solidarity Network were contacted by James Coll. He informed us that he had been receiving demand letters from the Lowell Group, a debt recovery company based in Leeds. They had bought a debt from Shop Direct and were now intent on collecting the money from Mr.Coll. The account had not been opened up or used by Mr. Coll, he had not signed for anything, and was both unwilling and unable to pay the debt. The Lowell Group are now threatening litigation in order to collect the debt. Nottingham Solidarity Network and James Coll ask you to email the Lowell Group the letter drafted below their email is post@lowellgroup.co.uk or write a letter to them at PO Box 172, Leeds, LS11 9WS. The letter is addressed to Mr. Andrew Bartle the company director of the Lowell Group and the signatory of the demand letters. We are writing to you regarding account number 94884193. As you know this is a debt purchased from Marshall Ward and their company Shop Direct. At present you are sending Mr. Coll letters threatening litigation due to an outstanding balance of £1541.27. We ask you to desist with these threats immediately. Mr.Coll has been in touch with you via Aid Uk, who informed you that the original Shop Direct account was not opened up by Mr. Coll, but a third party. We believe that you know of this third party, and that you have been in contact with them, but as they were unable to work out a payment plan you have continued to direct your focus on Mr.Coll. Mr. Coll was in hospital at the time undergoing treatment for cancer, treatment which is still ongoing. The account was not opened with his blessing nor knowledge. He did not sign for the account nor knew about it until the letters that you have sent to him. Furthermore, Mr. Coll does not have the means nor the inclination to pay for a debt built by a third party, and believes that you are unfairly targeting him at a time in his life where he needs to be focusing all his energies on dealing with the cancer treatment his doctors are providing him with. We believe that you would be gravely mistaken to pursue further action against a man who is seriously ill and who had nothing to do with the account to begin with. We are members of Mr.Coll’s community, and will be supporting him throughout this process. If this matter is not dropped we will take further action. We hope that this letter finds open ears and sensible minds. The following passages are intended to be a warning to people or organisations contemplating future dealings with the named party. All the information contained below is evidenced and has only been placed into the public domain following lengthy attempts informally, formally and via Nottingham Solidarity Network, to secure the return of J’s deposit. Mohammed ‘Shak’ Shakil is the former owner and landlord of a four bedroom house at 7 Alberta Terrace located in the Sherwood Rise area of Nottingham. Before moving into the property in May 2008, £650 was handed over as a deposit in order to secure the tenancy by the four tenants. This money should have been placed within one of the three national deposit protection schemes available in the UK. Upon later enquiry about whether the deposit had indeed been paid into the scheme as required, he claimed it had, but that the paperwork was located at his brother’s house. He also failed to provide an inventory of the contents of the property. Upon moving in, it became apparent that users of hard drugs had lived in the property previously. This was evidenced by burn marks on the carpet and finding several burnt drinks cans. There was also graffiti in the cellar. At first, aside from the problematic electrics which occasionally buzzed in the bathroom and caused light bulbs and the fuse box to trip, the house was maintained to a good standard. However, towards the end of the tenancy the landlord did not fix the upstairs shower despite numerous requests. By the time the tenants moved out, further deterioration of the property had occurred, with the kitchen roof leaking, the heating not functioning and ceiling cladding falling to the ground. During the residency period we were visited once a month and rent was handed over to Shak in person. If we wished to contact Shak, we had to ring a constantly changing mobile number. He was also using the address to have his correspondence posted to and then collecting it at the same time as the rent. The reasons for this soon become obvious as the letters were from a number of collection agencies. On one occasion agents of the court arrived to issue a court summons. During the period we were living in the flat, Shak only put the names of two residents down on the tenancy agreement. We believe this was because he wanted to avoid having to secure a multiple occupancy licence. Shak increased the rent on the property from £650 to £700 per month in October 2011. Upon insisting that the new tenancy agreement be issued to reflect this change, it was issued without a single named tenant on the agreement. He also failed to inform his mortgage provider, Northern Rock, that there were tenants staying in the building, claiming that he was still a resident in the property. They confirmed that us notifying them of our presence as tenants in the property was the first they had heard of this and stated that his mortgage did not allow this arrangement. Just before Christmas, upon receiving an eviction notice from Northern Rock, we learnt that Shak had failed to pay the mortgage on the property for the last six months and the house was being repossessed. Shak continued to protest, claiming this was a mix up and that the matter would be resolved. He also promised on numerous occasions to return our deposit. Upon threatening to not pay our final month’s rent, he claimed that if we did this he would definitely lose the house. Not wanting to be responsible for this, we handed over the cash. In retrospect this was naive. As matters progressed it became evident the house was definitely going to be repossessed. At this point Shak arrived with a friend when only one tenant was in the house and said he was removing the furniture and fittings from the flat to sell, in order to secure us our deposit. This was out of the question, as we still required essential items like toilets and central heating in order to live in the property! After an argument he eventually agreed to leave. When we notified Shak of our intention to vacate the property, he gutted the property, including ripping out floorboards, toilet fittings and copper wiring from the walls. Upon asking for the return of our deposit for a final time, he replied with a text beginning, “lol” and claimed we had damaged his house. He refused to pay us any money at all. Shak previously ran The Pawnbrokers Ltd located at 77 Mansfield Road before it entered insolvency. He has previously temped via Manpower employment agency in a customer services role for Eon at Loxley House in Nottingham city centre and currently does cash in hand work at NAD’s takeaway in Carrington, owned by his brother-in-law. His current whereabouts are unknown and we have never received any notification of where he actually resides. Our best guess is that he currently resides at his sister’s property, also in Carrington. Shak has also threatened violence against former tenants after the Nottingham Solidarity Network phone blockade against NADs takeaway. Upon moving out we have learned that he has been slandering the former residents of the property by informing his friends and acquaintances that, contrary to events, he was willing to pay us our deposit back until he discovered we had sold his furniture and trashed his house. We strongly dispute this version of events and would advise any people having future dealings with him to be aware of his consistent deceitfulness, intransigence and manipulation during our relationship with him. Over the past 3 weeks Nottingham Solidarity Network has been taking actions against a dodgy landlord, Mr Shakil, also known as “Shak”. The landlord collected rent from tenants whilst at the same time not paying the mortgage. This caused them to be evicted upon repossession of the house. The landlord also neglected to pay the £700 deposit into a deposit protection scheme as required by law, nor maintain the property. We see this level of mendacity as stemming from the control landlords and bosses have over our lives and thus we created Nottingham Solidarity Network in order to fight back. J contacted us and together we have come up with ways of collectivizing the dispute in order to apply pressure to get the money back he’s owed. On Saturday March 31st twenty or so friends of NSN met in Carrington to await a sighting of Mr Shakil in his new workplace; Nad’s takeaway owned by his brother in law. Once we spotted him getting into his car on the other side of the road we briskly made our way towards him. Whilst the group surrounded the car, J knocked on the open window and handed over a letter demanding the return of the £700. Mr Shakil accepted the letter, mumbled several unconvincing excuses and drove off at speed. This action had the benefit of showed Mr Shakil that this was no longer merely an issue between ex-tenants and ex-landlord, but had become a collective action. The relationship between landlord and tenant is one which has an intrinsically uneven power balance, with the landlord the owner of the property collecting money from the tenant who has no other option but to pay or be made homeless. When the tenant pays rent, but is still evicted from their home this is an abuse of this power. In order to redistribute this power we can respond collectively, ensuring that landlords and bosses in Nottingham are aware that their actions will elicit a response. Having received no response from Mr Shakil we decided to again target his workplace in order to remind him that action will continue to escalate until the deposit is returned. To this end Nottingham Solidarity Network called out for as many people as possible to contact the takeaway from 6pm to 10pm on Saturday the 14th April via phone, and politely ask for the circumstances to be redressed. Following a call out via numerous organisations, social media platforms and websites the subsequent phone blockade was hugely effective. We’d like to thank everyone who showed solidarity by taking the time to get involved.Scores of people reported ringing in, with calls frequently unable to connect and going to voicemail. Staff reactions included denying he worked there, resignation, intimidation and threats of violence. Obviously perturbed, reports suggest that a member of staff called the police at around 7pm and some callers who weren’t shielding their number were then contacted from a local police station and told to desist or face repercussions. Despite these questionable attempts at intimidation the call out had already gone out and people continued to ring throughout the evening. There have been no further attempts to contact callers by the police that we know of, but if anyone has had contact please let us know. Reports from takeaway staff indicated that takings were down 50% on a normal Saturday, one of the two busiest days of the week for them. This is a reminder of our power when we act collectively. These actions have obviously caused Shak discomfort as he took this occasion to make his first proactive engagement with the NSN. Unfortunately this was to contact a fellow ex tenant unconnected to NSN and make a series of threats against his person, whilst simultaneously admitting fault and expressing a desire to pay if he had the means. He also contacted the NSN phone. We refuse to be intimidated and hope this marks the beginning of Mr Shakil’s engagement with us. NSN will continue to take actions until Mr Shakil begins act in good faith and takes steps to begin to repay the outstanding deposit. collectively respond to Mr. Shakil’s treatment of his former tenants. repossession and the tenants eviction. illegally neglected to do so. politely asked to pay back the deposit. These requests have been ignored. Network will continue to contact Mr. Shakil until the deposit is returned. On Thursday March 8th NSN took part in its first action. 18 people assembled in town at lunchtime hoping to collectively present a demand from an ex tenant to his landlord for the full repayment of a wrongfully withheld deposit. This was to take place at his place of work, e.on customer services. The tenant entered the building and asked at reception for the landlord to come down to the lobby, with the plan being the rest of the group would enter to support the hand over the letter. Unfortunately during this exchange security became aware of the supporters positioned down the street and proceeded to close the entrance to the building. During we were informed that the landlord no longer worked there as of 3 weeks ago. Due to him being an agency worker they did not have contact details for him and were unsure of the legality of informing us which agency supplied him. They have promised to forward on the demand letter to the landlord via this agency. NSN will be meeting again on Thursday to decide what further courses of action to proceed with. This is NSN’s first action! We are accompanying J to take a demand to his landlord and would like to get a good group together to show solidarity. Meet at the corner of Mount Street and Maid Marion Way this Thursday (8th March) at 12.15pm. J and 3 friends were renting a Forest Fields house owned by landlord, Mr Shakil. When they moved in they paid Mr Shakil a £700 deposit which was never entered in any of the deposit protection schemes, as required by law. He also failed to take an inventory of neither the household’s contents, nor any damage to the property. At the end of December 2011 the tenants received letters from the mortgage holder, Northern Rock, saying that the house was to be repossessed due to mortgage payments not having been paid for 6 months. After having to go to court to delay their eviction and the time, stress and expense that entails they have now moved out of the dilapidated property and have asked for their deposit back from the landlord. Despite continuing promises to pay the deposit while still living there and knowing he has the funds, he is now refusing to pay for entirely spurious reasons. J contacted the Nottingham Solidarity Network to see if we could help him get his deposit back. We will be meeting at the corner of Mount Street & Maid Marion Way at 12:15 on Thursday to accompany J whilst he delivers a letter to Mr Shakil demanding the return of the deposit and making clear that we will take further action if this is not done. We welcome all supporters to join us. Welcome to Nottingham Solidarity Network. We have just started our blog as a contact point for anyone interested in getting involved. We are starting this network in response to the innumerable housing and employment abuses that we see every day in our city. We know how difficult the law makes it to bring landlords and employers to justice, and we’re going to do something about that. We are modelled on the very successful Seattle Solidarity Network (SeaSol). Their site will give you an idea of the sorts of projects and tactics we are looking forward to. We are not a casework or charitable organisation; we won’t solve your problems for you, but we will help you solve them yourself. Many are stronger than few. Please do get in touch if you are interested or if you could use some help! 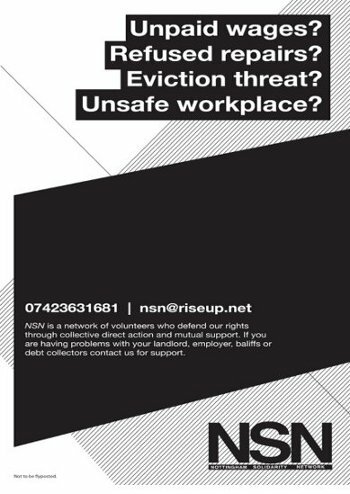 You can email us at nsn AT riseup.net or call us at 07423631681 – leave a message with contact details and we will get back to you.